Thank you for persevering with Woodmode/Brookhaven on our behalf to replace so many cabinet door-fronts and drawer-fronts. The molded composite results in a much cleaner/smoother finish product. All in all, the kitchen came out really beautiful and we are very pleased with the workmanship and the competency of your company. Henry is a fine craftsman and most meticulous. John measure beyond anyone's dreams but it really pays off. And of course Ed is a master in keeping the project moving forward. We are so happy we chose Holland Kitchens to refurbish our kitchen. Warmest regards. Joan and Dennis R.
Dear Jim, We wanted to let you know what a wonderful job your staff did on our kitchen. WE LOVE IT!! We were so impressed with the whole process. You should be proud to have such talented people working for you. Kate Dibattista is terrific. She designed a kitchen that is functional and looks beautiful. Friends walk into my kitchen and say, "Wow!" Henry was always prompt, courteous, and did an outstanding job installing everything. Walter's tile job was outstanding. What a perfectionist. Alan was very helpful in making sure everything was at our when it was needed. Ed made sure everyone was here when needed and had our kitchen completed in four weeks. We have heard many horror stories from people about remodeling a kitchen, but we were extremely pleased with our remodeling project. Again thanks for a great job. It's a pleasure to be in the kitchen again. Kevin and Cathy K.
Our kitchen is beautiful, we love it! Your team at Holland was fabulous to work with. Kate, our designer was just wonderful and guided us every step of the way with her knowledge and warmth. Your whole team was a pleasure to work with and delivered the kitchen of our dreams. We would be glad to show it off to other folks if they are interested in seeing it. Thanks again for our wonderful kitchen! Mark & Fran P.
Thank you for the wonderful job on the kitchen. I can't tell you how grateful I am for you taking over when you did and giving us such amazing service. You were right with all your suggestions and I could not be happier. We appreciate your patience with us as I imagine it was quite difficult with us being out of state. The kitchen looks SPECTACULAR! Henry is a perfectionist and I can not say enough about the quality of his work. It was refreshing to watch him at work, he clearly loves what he does. Thank you again!. Joe & Pam C.
Carl has gone above and beyond from the very beginning. His expertise, professionalism and desire to make us happy has superseded our expectations. It has been a seamless process and his eye for design and making things work is impeccable! As our cabinets are installed this week, we can’t thank him and Holland Kitchens enough!! 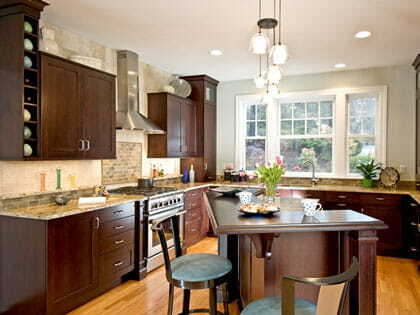 Lindsay P.
The quality of the cabinetry and workmanship cannot be beat. Melissa T.